SIBL Carrer Opportunity 2017 – www.siblbd.com . Social Islami Bank Job Circular 2017 with Details of Application System. SIBL Job Circular & Apply Process 2017 has been found my website http://AllExamResultBD.com/. Social Islami Bank Limited (SIBL) is fully Shariah based modern Islami Bank in Bangladesh. 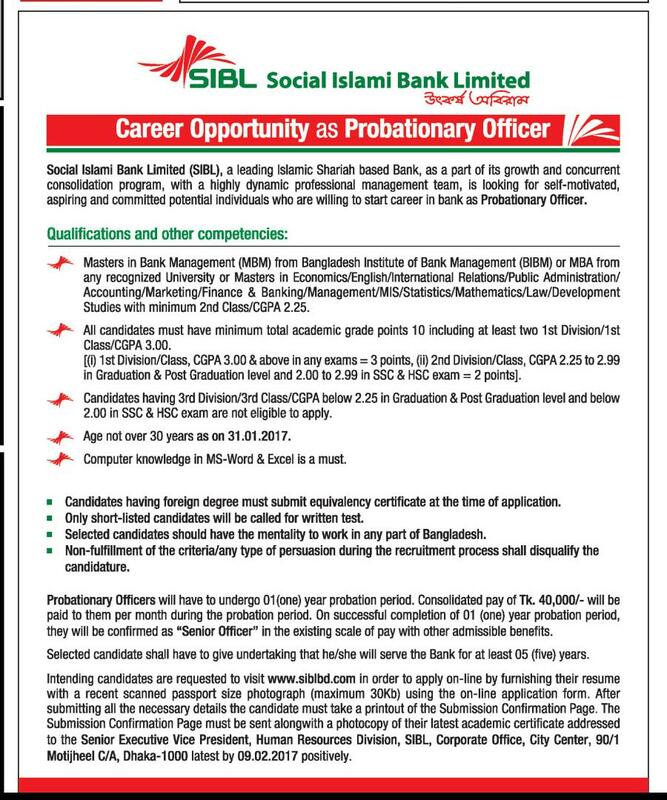 Social Islami Bank Limited (SIBL) recently published job circular. This job position is “Probationary Officer“. It is the Family Empowerment Islamic Micro-Finance Program under voluntary and Non-Formal Division. Social Islami Bank Career to build a long-term sustainable financial institution through financial inclusion and deliver optimum value to all stakeholders. Social Islami Bank Limited is a contemporary, upbeat brand of distinctive quality of service and solution that offers a rewarding banking experience as preferred choice of banking partner every time, everywhere. Lets Check details of Social Islami Ltd. Bank Job Circular 2017 and Application Process. Social Islami Bank Job Circular 2017 with Details of Application System. All Concerned Applicants able to Apply before Deadlines. So if you are ready to take a voyage in a vibrant and challenging corporate environment and eager to fast track your career in a professional and institutionally managed environment, please to apply to Social Islami Bank.